In this series of blog articles, we’re taking a look back at the year that was for agricultural commodities and provide our insight for the year ahead. This instalment highlights 2018’s key movements in the wool market and what to keep your eye on in 2019. In the calendar year 1.599 million bales were sold, 182,000 fewer than for 2017. This reduction has only become a factor from July 2018 onwards with the drought impact on wool cuts and sheep numbers resulting in 177,000 bales less sold compared to the corresponding previous six-month period in 2017. There was also a response from wool producers to the softer market and they were prepared to take a bullish stand on prices. As with all sheep producers, wool growers have now for some time received the benefit of good sheep prices as well as prolonged strong wool prices contributing to strong income flows – this allows wool sellers to hold wool in store if they view prices as soft and likely to recover due to supply constraints. Despite its early bravery in October, the EMI was unable to sustain the heady 2,000¢ plus levels, eventually slipping 151¢ to finish the calendar year at 1,862¢. In US$ terms it also retreated, dropping 115¢ to 1,346¢. 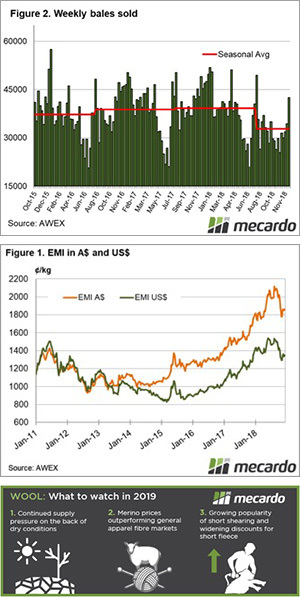 While November had the EMI briefly below 1,800¢, resistance to meet the market from wool producers produced a recovery which was maintained to the end of the selling year. Reflecting on the calendar year, the EMI posted a 5.8% increase; however, this mirrored the fall almost exactly in the Au$, the EMI in US$ terms in fact is slightly lower compared to January 2018. Moves in individual MPG categories were also impacted by the drought on the east coast; the resulting increase in fine wool constrained the finer end of the clip while reducing supply (again predominately drought-related) in medium wool MPG’s assisted the price. The best performed were the 20 to 23 MPG’s, while the worst included Superfine types (oversupplied), 26 & 28 MPG (lack of supply reflected in reduced demand) and Cardings which have now lost all of the lustre they exhibited on their spectacular run upwards. 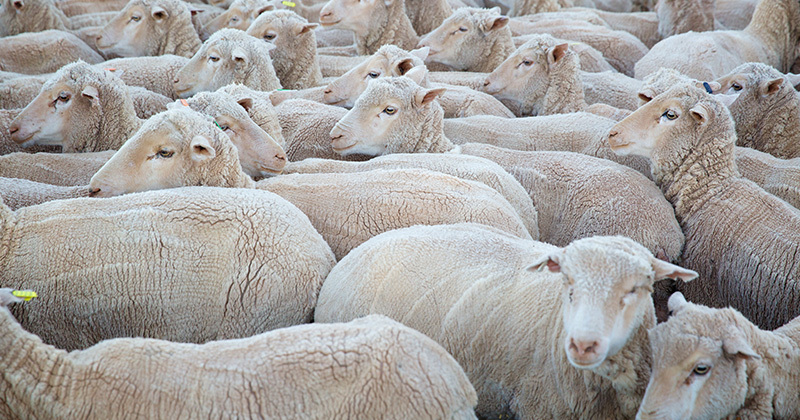 It is unlikely that 2019 will see any change to the trend of reduced supply, as large-scale abattoir throughput of mutton sheep points to a continued destocking in drought areas. This combined with the continued dry period negatively impacting on fleece weights will retain supply pressure on the market. Any rain-induced supply increase will take time to come through (it doesn’t rain grass! ), and while growers restocking by holding onto more ewes will occur post good rain, it will also take time for the flock to grow coming of this low sheep number. Merino prices outperforming the general apparel fibre markets. All MPG’s 23 & finer are trading above 2,000¢, and with only the Cardings indicator and 30 sitting just below the 90 Percentile level. All other types are trading at levels experienced for less than 10% of the time since 2004. The 19 MPG at 2,248¢ (end of December) has been below this level for 98.2% of the period measured from 2004, and therefore only 1.8% of this period above the current market level. Percentiles don’t forecast the future price levels, but they do provide a view of where a price sits from a historic perspective, confirming that this is a very good time for wool prices. That does not mean prices cannot fall, as that depends in part on the general movement of apparel fibres which have been weakening this season. Shearing at shorter intervals continues to be popular. The annual supply of short length Merino combing wool (50-69 mm greasy length) as a proportion of Merino combing fleece volumes from the mid-1990s onwards has taken a sudden increase in recent times. Farmers are good at responding to price signals and the increase in supply of short length Merino fleece since 2015-2016 fits with a delayed response to the minimal discounts for short length wool which started in 2013. The fashion cycle has turned, as it usually does, and discounts for carding length wool have reverted to pre-2013 levels. Short length Merino fleece discounts will have to contend with both this change in cardings price levels and a continued increase in supply in 2019, which should see discounts widen, especially in mid-2019.